Echinacea is a flowering plant that belongs to the same family as daisies. Also called purple cone flower, echinacea can be seen growing wildly across central and the eastern U.S. An article on the Wellness Mama website noted that Native Americans used the plant for centuries to treat common infections. The plant’s name is derived from the Greek word ekhinos, which means hedgehog. This is due to the flower’s cone that closely resembles the animal. Echinacea is commonly used as a natural remedy to fortify the body’s immune system. An entry on the health and wellness website Organic Facts explains that the plant’s immune-boosting properties are largely due to the presence of various chemical constituents that influence the body’s chemical processes. In fact, previous research shows that taking echinacea regularly may help stave off colds by up to 50 percent. The plant is also found to stimulate the production of t-cells and white blood cells that combat a wide array of infections. Aside from this, echinacea is known to contain echinacein, a potent compound that prevents bacteria and viruses from penetrating otherwise healthy cells. The plant is also known to inhibit certain infections from recurring. Echinacea is found to enable various immune-boosting compounds to accumulate and remain in the body, thus mitigating the risk of repeat infection. Aside from this, the plant is touted to contain anti-inflammatory properties that alleviate skin disorders and reduce the irritation and mucus deposition in the respiratory tract. This relieves respiratory disorders such as bronchitis, tonsillitis, and pharyngitis. Additionally, the anti-inflammatory effects of echinacea are known to relieve pain and swelling of the joints. In addition, echinacea is touted for its potential in diabetes management. A previous study noted that the plant helped regulate insulin metabolism and blood sugar levels. Similarly, the superfood is found to effectively cleanse the lymphatic system — which includes the nodes, tubules, fluid and glands — and rid it of toxins, wastes, and inflammatory byproducts. The plant is found to relieve congestion and swelling and bolster fluid flow in the system. Moreover, echinacea is valued for its potential in cancer prevention. The plant is shown to prompt the body’s immune system to eliminate potentially cancerous cells. While the plant is not a known antioxidant, it has been found to stimulate cancer-fighting cells to counter the harmful effects of free radicals and prevent the onset of cancer. Furthermore, echinacea is touted to improve oral health by treating gingivitis and enhancing teeth strength. The plant is also known to speed up wound healing and recovery. Echinacea is particularly beneficial to the immune system. Likewise, the plant benefits the respiratory, digestive, lymphatic, and skeletal systems. The plant also supports oral health and skin condition. Echinacea is a potent superfood that works best as an infused tea. According to an article posted on The Paleo Mama website, both dried and fresh parts of echinacea can be processed into infused tea, with similar immune-boosting effects. The article also noted that echinacea can be processed into a potent tincture. Echinacea prevents infections, respiratory conditions, and inflammatory pain. 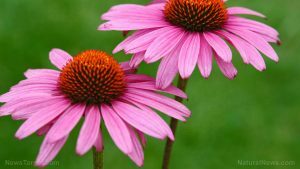 Echinacea staves off cancer, diabetes, oral diseases, and skin disorders. Echinacea is beneficial to the immune, respiratory, and digestive systems. Echinacea also supports the lymphatic and skeletal systems. Echinacea promotes healthy teeth and gums.